Location: A7 (E43) exit Langenau, through Langenau, Nerenstetten, Weidenstetten, Altheim(Alb), Heuchlingen. At the road between Altheim and Heuchlingen in the Hungerbrunnental. 20km from the Motorway exit. 500m walk. 1533 Hungerbrunnen and an annual dance at easter monday first written mention. 1640 marked in the map by Bachmayer. 1724 easter monday dance at the spring is forbidden by the Herzog von Württemberg. 1844 first metion of the Brezgenmarkt. 1939 maximal outflow of 700 l/s measured. 1977 deep borehole (190,5m deep) close to the spring. 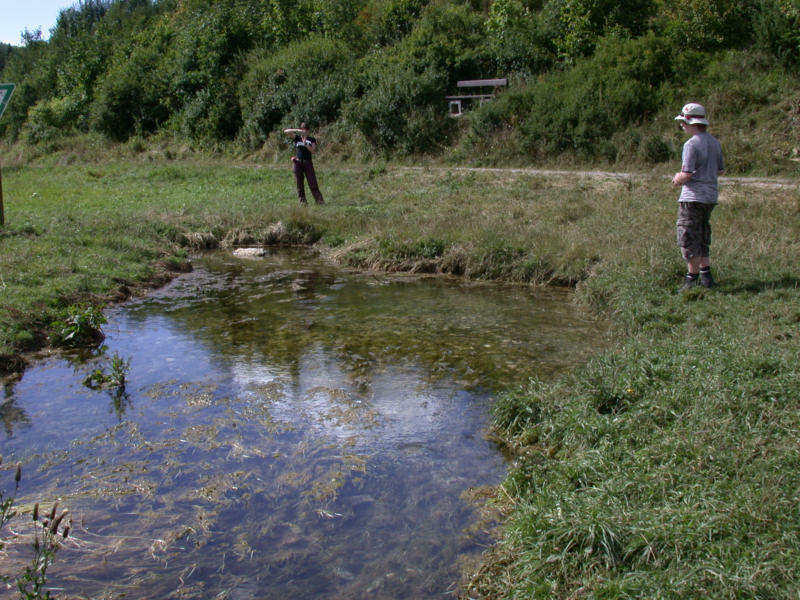 The Hungerbrunnen (well of famine) is a typical intermittent spring which is common in karst areas. Such springs become dry for a considerable time during the year. In the case of the Hungerbrunnen the spring is dry most of the year, in drier years there is no water all through the year. When it flows the spring flows during spring, rarely until mid summer. During the rest of the year the spring is not starting to flow even after heavy rains. The changes from year to year are very big, the spring might be dry for several years and then flow one year until August. 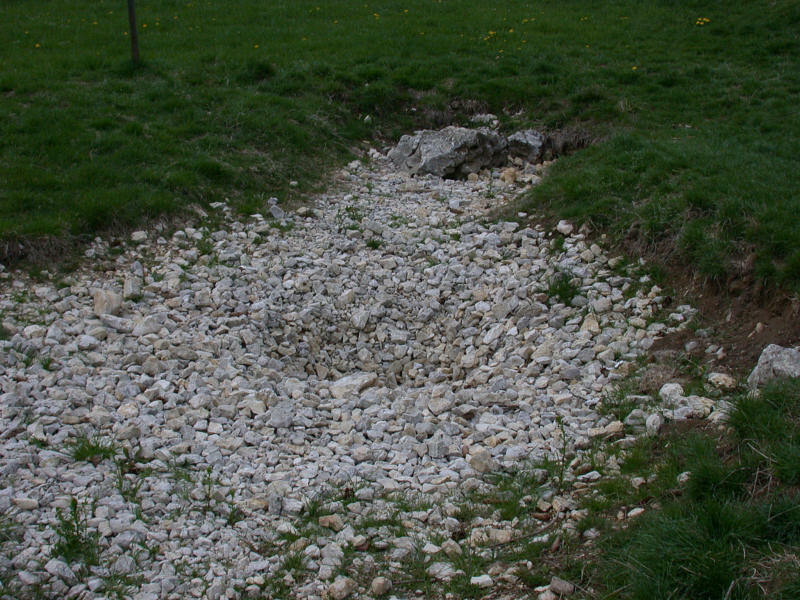 When the spring is dry it is just a shallow pit in a meadow filled with white limestone. 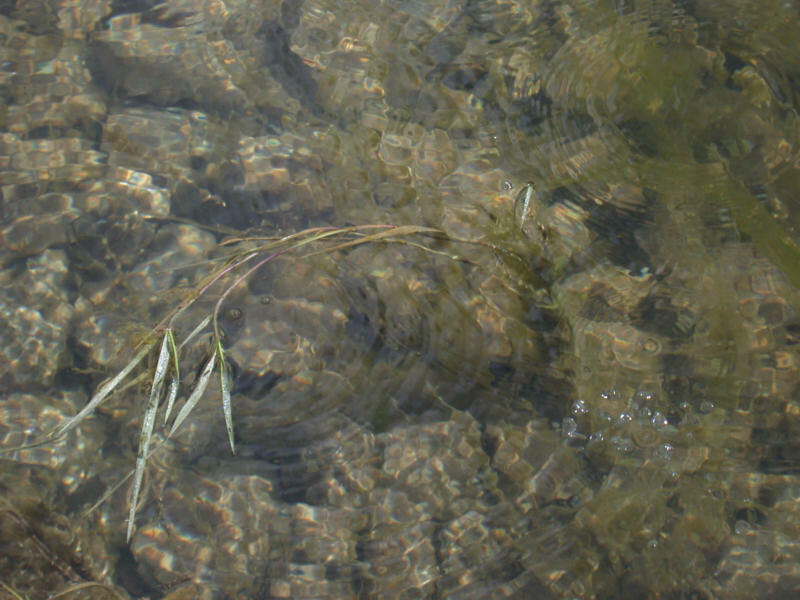 Much of the upper bed of the brook is covered by grass and form only a shallow pit which is difficult to see. It runs across the green to a second dry runnel coming down the valley. Before the spring was equipped with interpretetive signs, the start of this runnel was often erroneously thought to be the Hungerbrunnen. 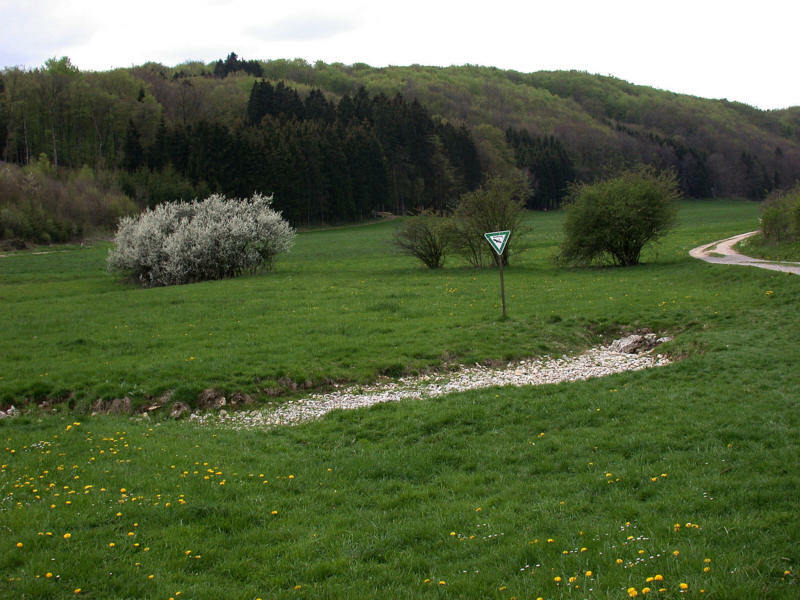 The field where the Hungerbrunnen is located is at the border between three villages, Heuchlingen, Heldenfingen, and Altheim. It is owned by all three towns together. During the Middle Ages the place was a so-called Freiplatz (place of liberty) which had a special legal meaning. The field with 40m length and 30m width did not belong to any lord and so nobody was able to pursue someone who had reached this spot. During centuries a spring festival took place on this spot, either of Easter monday or on one of the following two sundays. But after some incidents, probably a noisy fight or quarrel, the festival was forbidden in the early 18th century. Some 100 years later it was revived with a Brezgenmarkt, a market named after the Brezge, a local sort of roll which was sold on this market. The brezge or bretzel is a Swabian specialty, internationally known as pretzel, but the original version is a soft roll. It is also brown and sallted, and has the characteristic three holes, but it is much bigger, about the same wheight as a bun. It was a typical market for grocers, where goods were sold which were not available in the small towns. It was held on Pentecost monday, and was also used as to oganize marriages. It is held until today with thousands of visitors which have to park at the next town and are carried to the market with shuttles. The strange name of the spring, which is connected with famine, is a result of old legends. They connect the flowing of the spring with bad harvests. A connection seems possible, as a flowing spring means a very wet year, which may result in a bad harvest. A statistic evaluation during the mid 20th century could actually not find any connection between the spring and the harvests. 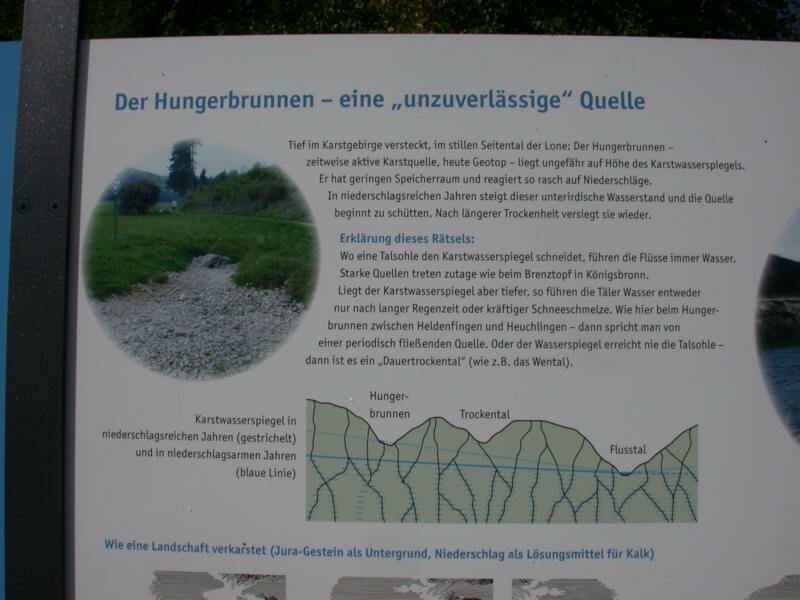 It seems the name Hungerbrunnen is rather common in the German speaking countries, but not all of them are related to karst. 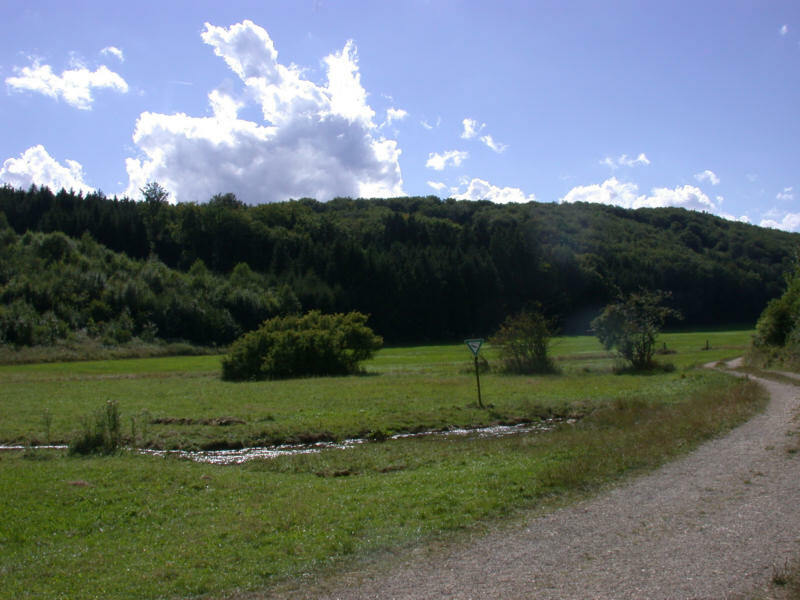 A similar legend was told about a spring near Vienna, where the precipitation of the next year could be determined by the production of the spring. In the area of the Lone valley the level of the water table changes during the year between 10m and 18m. The water table is simply a result of inflow and outflow. 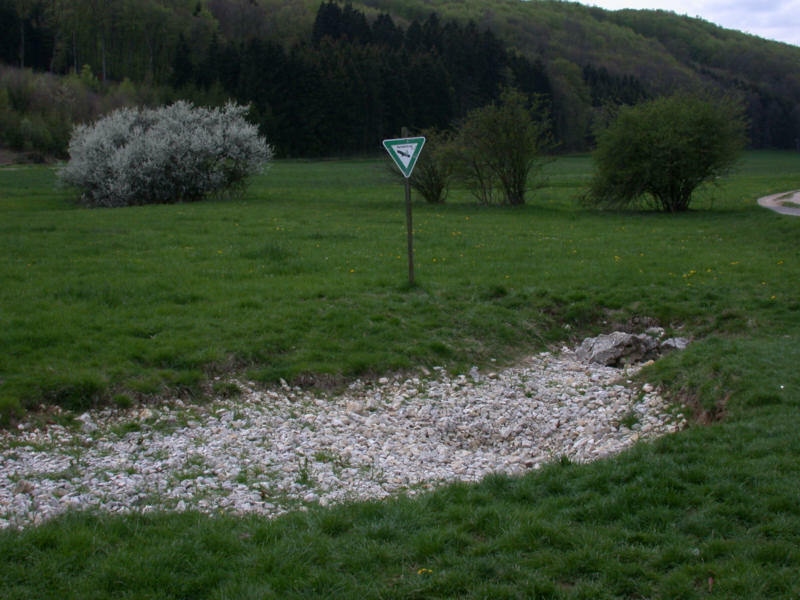 If the water table is very high it reaches the level of the Hungerbrunnen spring. So it is possible to see if the spring is flowing by measuring the water table. 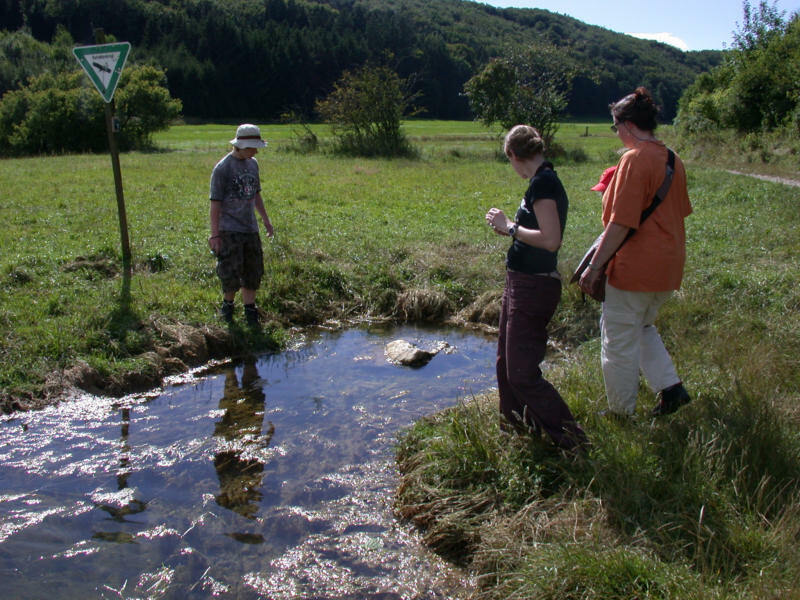 This works not only in the nearby drillhole, but also at monitoring points near the Donauried, at the springs of the drinking water system, which is some 20km away. Another interesting detail is the fact, that there actually a brook springs from the spring, which is theroretically a tributary to the Lone river. At least it once was, there is still a river bed, but today it just vanishes in its bed and never reaches the confluence. The whole river bed runs through karst and is full of cracks, connected to the water table. So if the water table sinks somewhere along its bed, so does the water of the brook.